Oregon has made national headlines having the second highest rate of opioid drug abuse in the nation. At the same time, the Oregon Pain Management Commission recently stated we have over 750,000 Oregonians who live in chronic pain. With these numbers, healers do all they can to help patients, so they can live a better life. Unfortunately, we now have an opioid epidemic hand-in-hand with our high number of chronic pain sufferers. People are in pain, and we want to help…but maybe opioids alone are not the answer. As an herbalist and cannabis consultant, I’m inspired by the positive results many people have reported to me and my associates at Breeze Botanicals when using cannabis to address pain. Some people only need a small daily dose of cannabis alone or in conjunction with other nourishing herbal nervines, like passionflower, oat tops, and skullcap. However, some people find they need to slowly titrate up to address severe pain in conjunction with a small amount of opioids. Unfortunately, many people live in fear that their pain doctor will make them choose between cannabis and stronger pain drugs. People have reported to me that if they try cannabis to address their pain they will lose access to stronger pain pills. Which is too bad because many people find they only need a small amount of both, as cannabis seems to boost the effectiveness of their pain pills. In 2016, the CDC urged doctors to stop testing for marijuana. The guidelines also discourage doctors from dropping patients if marijuana is detected. It’s just a horrific shame to see doctors, who take an oath to do no harm, discharging patients when THC is detected; especially when the CDC urges doctors not to even test! This does more harm than good. These are people trying so hard to function and usually finding relief through cannabis and small dose opioids. They are pharmacodynamic and although much of the data is anecdotal we cannot ignore cannabis’ role in helping with pain management any longer. In my attempts to be a responsible dispensary owner and cannabis consultant my staff and I attend various plant medicine and cannabis educational events around the country. I encourage Oregon practitioners to do the same and take the time to learn about cannabis as a medicinal herb. I was inspired last year at the Medicinal Cannabis Conference in Arcata, California by Dr. Dustin Sulak who practices in Maine. He spoke on clinical applications of cannabis, the endocannabinoid physiology, and solving the cannabis dosing dilemma. “It’s time we acknowledge the solution that’s right in front of us and make this life-saving treatment available,” Dr Sulak said about cannabis. This April 29-30th he will be back, along with other leading cannabis researchers, at the 3rd annual conference in the same town. If interested in expanding your cannabis knowledge consider attending this educational event. Learn more at www.medicinalcannabisconference.com. Alternatively visit Dr. Sulak’s website at www.healer.com to view information on cannabis and opioids along with other educational information. It’s about sharing and learning and working together to help Oregonians live a better life. 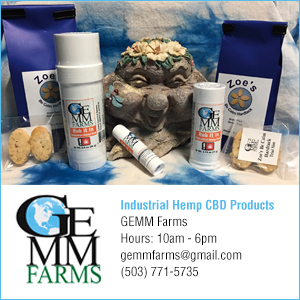 I encourage you to forward this information to your compassionate practitioner here in Oregon to make sure they educate themselves about the human endocannabinoid system (ECS) and how phytocannbinoids found in cannabis may help address many illnesses humans suffer from as a result of an endocannabinoid deficiency. Healers have an obligation to their patients and that includes embracing the possibility cannabis might be the right choice. Let’s end this opioid epidemic and work towards a better, healthier Oregon.